Based in Oslo, Norwegian artist and conceptual filmmaker Sara Eliassen often returns to questions of self in relation to the audience’s gaze as typically positioned in society. She uproots expectations of narrative structures in cinema, with use of iconic cinematic moments as departure points for her investigations of the viewer-character dynamics and of collective memory in film. 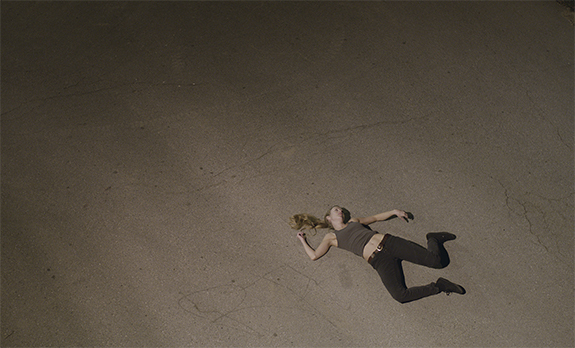 Set in a sleepy, nameless coastal town, Eliassen’s film A Blank Slate unfolds as the main character finds herself in a lucid state inside a hotel room. Attempting to grasp her surroundings, she falls deeper into a metaphysical reality where her memories becloud her perception and the fragmented passing of time pulls her to witness herself from a salient distance. A performance by Laetitia Sonami will act as a prequel to the screening of A Blank Slate. A key collaborator on the sound concept and design for the film, Sonami lives in Oakland and works in sound, installation and performance. With skilful command of her environment and an insatiable sense of play, she guides the audience to hear with her the hidden world beyond our reach. Through invented tools and manipulations of old and new media, Sonami’s visceral live acts unearth found audio landscapes previously unnoticed by our conditioned ear.